PDF to Picture Converter is convert your PDF content to top quality pictures and images that you can reuse them in Microsoft Windows applications like MS Office, MS Publisher and MS Visio, Adobe Photoshop, etc., you are able to also upload the pictures to your website or blog for sharing. PDF to Picture Converter is support both vector and image modes, PDF to Picture Converter produces just what you need to enhance your documents and presentations. Choose vector mode (WMF/EMF) if you want to extract the objects and text for editing. Image mode (BMP, JPG, TIFF, GIF, PNG, PCX, TGA, etc.) is finest when you don't must make any modifications to the file but want a modest file with high resolution. 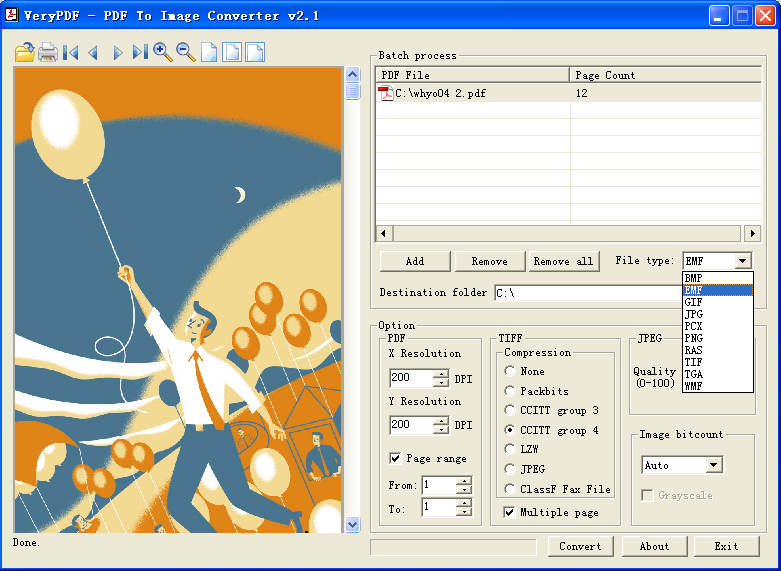 Convert PDF files in editable vector (WMF/EMF) or picture (BMP, JPG, TIFF, GIF, PNG, PCX, TGA, etc.) formats. Convert ONE PDF file or lots of PDF files in batch mode. Accurately reproduces PDF objects within the Windows picture format (WMF or EMF). Preserves searchable PDF text as editable text in WMF and EMF output. Merges characters into words and one-line text strings for enhanced editing and searching (this feature is supported in WMF and EMF formats, available in custom-build version only). Make use of font identify mappings in the course of conversion (correct or substitute, available in custom-build version only). Able to keep the PDF paper size in output formats automatically. Crop output image formats to eliminate white margins (available in custom-build version only). Able to skip some special vectors, pictures and/or text during conversion (available in custom-build version only). Converts multi-page PDF to many single-page Web useable images. Simplified interface for more direct conversions to WMF and EMF formats. Able to support non-standard font encodings. Standalone application, without need Adobe Acrobat or Adobe Reader installed in your system. Convert PDF into multiple page of TIFF images. Convert only selected pages of PDF you want to convert. Suitable with all Windows systems, like Win 98, NT, 2000, XP, Vista, 2008 and Windows seven.